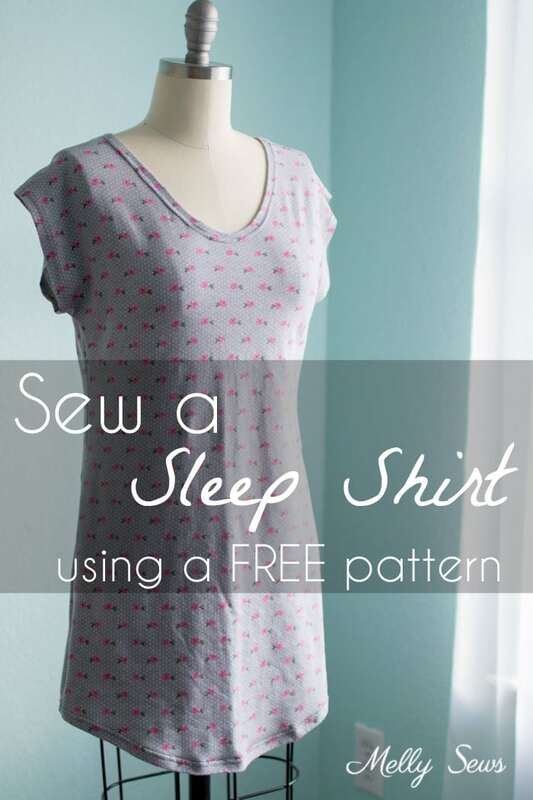 Hey y’all, today’s tutorial is how to sew a sleep shirt or short nightgown. 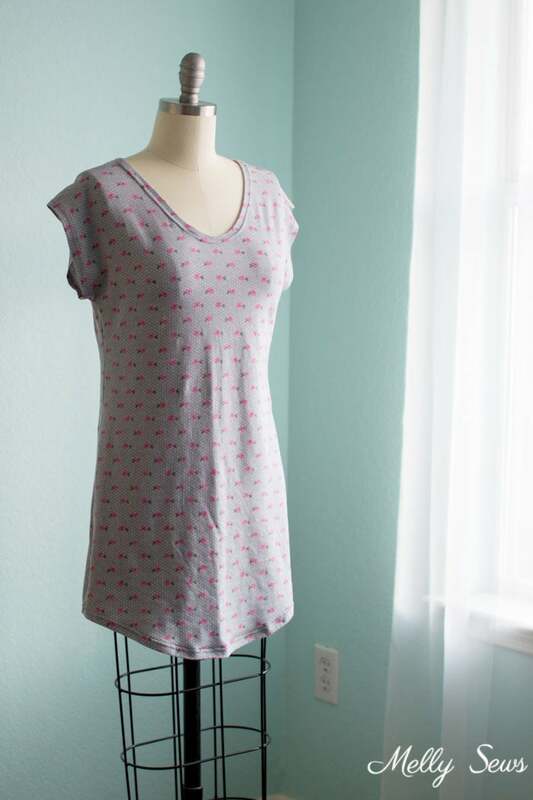 While I’m a tank top and boxer shorts or pajama pants kind of sleeper, I know a lot of people prefer a nightie, so today I’ve got an easy way to make one. The pattern. Click over to this post to find out how to get it. 1 1/3 to 2 yards of fabric; add 1/3 yard of fabric to the yardage for your size on the materials chart for Blanc. To modify the pattern, first you’ll want to add 5 1/2 inches at center front and center back, curving up to 4 inches added at the sides. 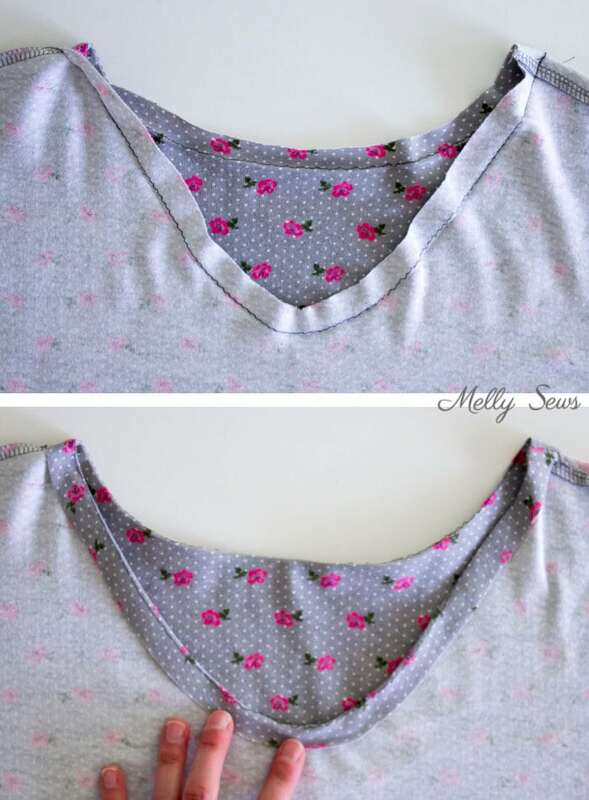 This modification will make the shirt long enough to sleep in, and also add a subtle curve to the hem. 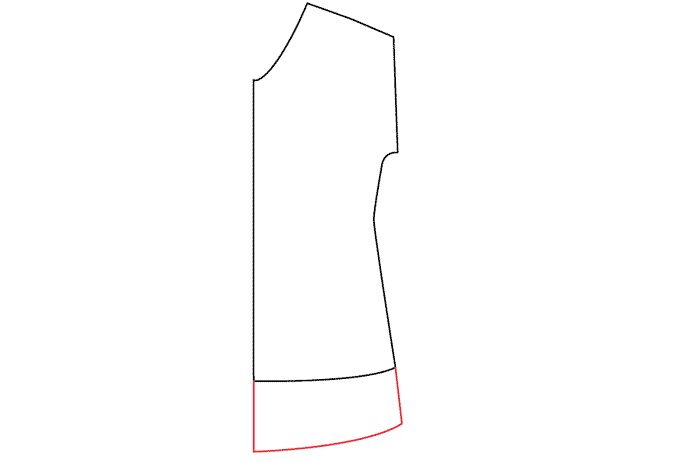 To sew, follow the instructions in the Blanc pattern, finishing with a hem turned 1/2 inch to the wrong side once on the neckline, sleeve hems and bottom hem. 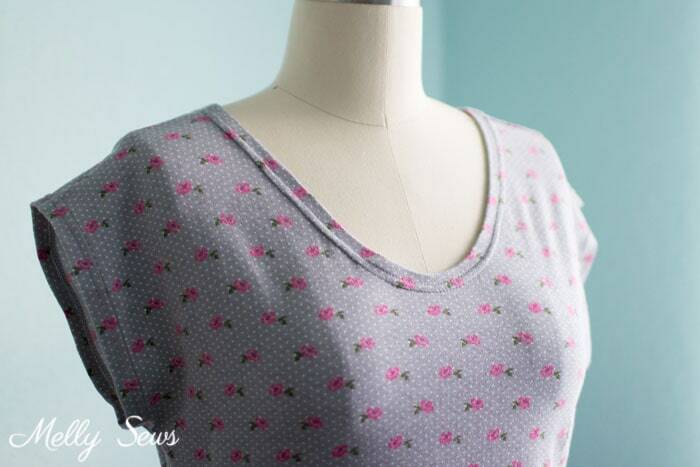 I want to show you my favorite trick for hemming curves on knits like this. Start by basting a straight stitching line where you want the hem to fold. Then fold and press the hem to the wrong side along the stitching line. The stitching helps keep the hem flat, as you can stretch the raw edge of the fabric on the wrong side around the curves as long as you don’t stretch the stitching line. Use starch and pins as needed. Then choose a knit hemming method. Pretty much any of the methods in that post will work in this case. 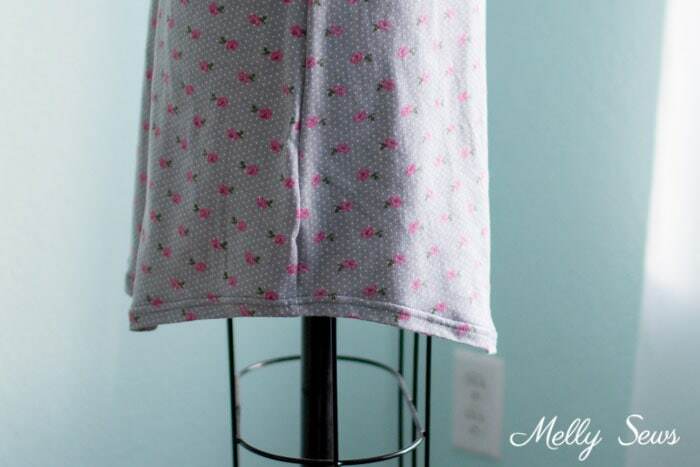 I used my cover stitch machine, but a very similar hem can be achieved with the twin needle. Finally, pull out the basting stitches. You might want to give your hem another press after that, but otherwise you’re pretty much done! Thank you for this suggestion. 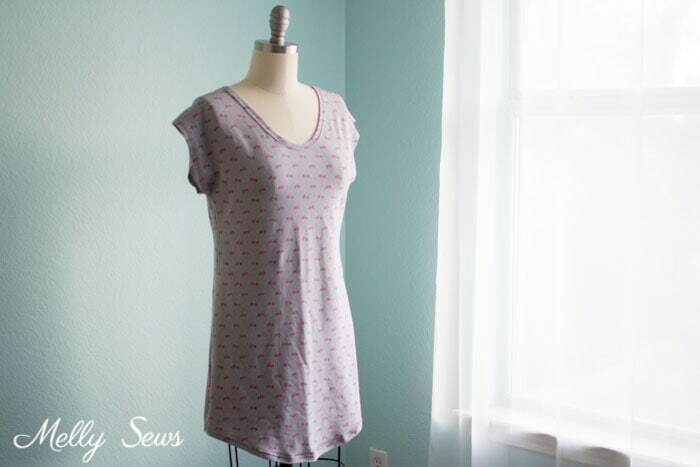 I had wanted a simple pattern to make myself some nightgown. I took my already sized Blanc t-shirt pattern. I am a very curvy great-grandma. I added more than you suggested because I like for mine to hit me just below my knees. I kept an A-line shape as it got longer, but I did your shorter on the side trick. The sleeves were done a little differently. I like full sleeves, 3/4 long. I just extended these, making a modified bell shape. Then to my machine. I did a flat fell seam on the sides and shoulders. For both the neckline, sleeve hems and dress hem I used your little trick. What a great trick. I was sewing on a thin thermal knit, and this worked perfectly and for the stretch stitch, I used decorative stitch. Flowers, Doggies, and a tribal stitch, added a great touch, along with the patch pockets on 2 gowns, and the side pockets on the other two, which i lined with a very nice flannel. Thank you for this. I bought my fabric online from Fabric Mart for $1.99 a yard. I have made 4 gowns, and 2 Henley type tops. And I still have fabric left. Lounge pants are next! Thank you ever ever so much! And, I love your emails and your patterns and your advice!